Purchase boat registration numbers that will ensure you are not only compliant with the law but that will also compliment the rest of the look and feel of your boat. 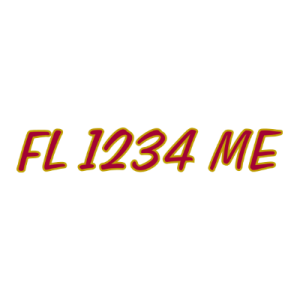 These custom boat registration numbers have been specifically design to compliment our Captain Hook collection. Boat registration decals come as a set of two (2) for both the port and starboard side. For additional protection against fading from the harsh UV rays from the sun, we strongly recommend upgrading to our premium vinyl solution.